Good News! now you can check,analyze and block fake contacts on facebook for free. Now parents can just guide their children to subscribe a free app rather keeping a spy on their Facebook friend list set them free by using FakeOFF. The company's founder Eliran Shachar, say that the FakeOFF application will be free of charge for India users until next year. "India is the leading country with fake Facebook profiles in the world, it's important to help fight this phenomena"
FakeOFF helps youth to protect them by keeping a check on their real time situation of friend list which at least saves them from getting webbed by unrealistic promotions, sexual abuse, unwanted offers and spammers. This application is designed in such a manner that allows you to filter those friends who either have used fake image or have updated information which is not related and copied from somewhere it will also tell you suspect level of that page or profile by rating pattern, an algorithm check also suggest you necessary steps need to be taken in order to protect yourself. Indian cyber law states that every false identity and I.P address should be penalizedso this is the best way to find out suspect in your surroundings even political campaigns which trying to misguide people with their fake numbers. 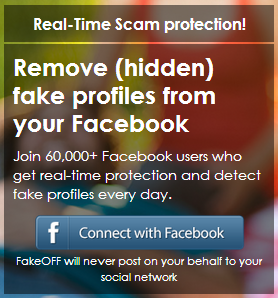 "FakeOFF – Be Safe" was founded and developed by the Israeli Entrepreneur Eliran Shachar , 34, who has been in the internet field and start-up's for the last 11 years and recently identify the problem of fake users hidden inside the social network playground. An action had to be taken to help Facebook users protect themselves from the dangers of fake profiles. This action came in the form of the FakeOFF application. To further involve their directives with youth entrepreneurs. "FakeOFF" is taking part of the BizSpark Plus partner program, Microsoft YouthSpark program, designed to assist strategic and promising young startups worldwide.